Zhu, D., Yang, H., Chen, Y., Li, Z., Wang, X., and Chen, H. (2017). "Fouling and slagging characteristics during co-combustion of coal and biomass," BioRes. 12(3), 6322-6341. 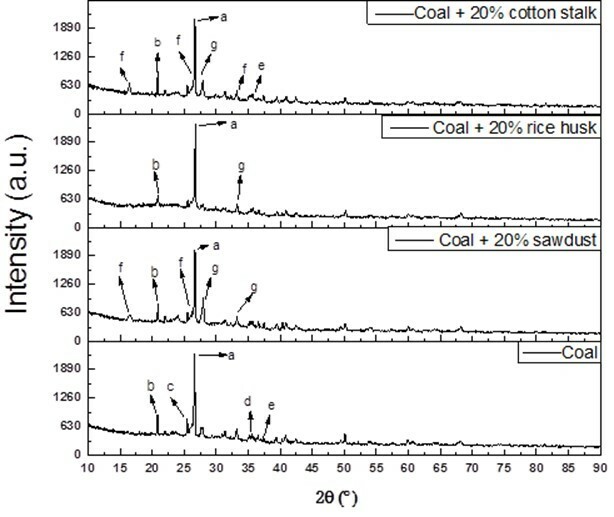 The effects of different kinds (cotton stalk, rice husk, and sawdust) and proportions (0%, 10%, 20%, and 30% based on weight) of biomass and operating conditions (temperature and excess air coefficient) were evaluated relative to the ash deposition characteristics during the co-firing of Huang Ling (HL) coal with biomass. The experiments were performed in a drop-tube furnace. The chemical compositions and mineral phase characteristics of the collected ash particles were analyzed using scanning electron microscopy with energy dispersive X-ray (SEM-EDX) and X-ray diffraction (XRD), respectively. The results showed that the most severe agglomeration, from co-firing coal with cotton stalk, was due to the higher content of alkali metals, especially K. The amount of K in the ash increased with an increasing proportion of cotton stalk, and ultimately, agglomeration was more serious. When the combustion temperature increased from 1050 °C to 1300 °C, the dystectic solid compounds were transformed into eutectic compounds. The increased excess air coefficient accelerated the sulfur reaction, but did not relieve the heavy sintering. Consequently, limiting the content of biomass in the fuel blends, maintaining a lower combustion temperature, and a suitable level of excess air were determined to be necessary for the co-firing of coal and biomass. Biomass is an ideal alternative to fossil fuels, as it can be grown in a sustainable way through a cyclical process of fixation and release of CO2, which thereby helps to mitigate global warming problems (McKendry 2002). The co-firing of biomass and coal has been proposed as one of the most cost-effective technologies to use renewable materials on a large scale (Turn et al. 2006). There are many advantages to blending biomass with coal prior to burning. The emissions of SOx and NOx are reduced in most co-firing tests, depending on the biomass fuel used, and the CO2 net production is also inherently lower because biomass is considered to be CO2 neutral (Abreu et al. 2010). Recently, investigation into the co-firing of fossil fuels with biomass has been drawing increasing attention because partial replacement of fossil fuels is possible in many cases. This fact alone gives extensive support to the growth of power sectors in developing countries (Sahu et al. 2014). Sometimes biofuel products are mixed with coal to achieve better control of the burning process (Wang et al. 2009). Burning biomass with fossil fuels has a positive impact, both on the environment and on the economics of power generation. However, biomass has high contents of easily vaporizable alkali metals and chlorine (Di Blasi 2008), which may result in several ash-related problems, such as fouling, slagging, corrosion, and bed agglomeration (Yang et al. 2014). Ash-related problems from co-combustion remain as longstanding challenges for co-firing coal and biomass, particularly agricultural residues, such as cereal straws, that contain high amounts of alkali/alkaline-earth metals (0.5 wt.% to 2 wt.% potassium) and chlorine (up to 0.2 wt.% to 1 wt.%) (Shao et al. 2012). The behavior of alkali metals during combustion is known to have a direct correlation with ash-related problems and strongly depends on both the fuel composition and temperature (Knudsen et al. 2004; van Lith et al. 2008; Johansen et al. 2011). Many researchers have focused on the release of alkali metals during biomass combustion, but the co-firing process results in more complex agglomeration behavior due to the differences in the physical and chemical characteristics of the biomass and coal (Nystrom et al. 2017; Yang et al. 2014; Zhou et al. 2017). It might not be possible to predict the properties of the ash formed during co-combustion from the known characteristics of the ash formed from each fuel individually (Vamvuka and Kakaras 2011). The blending ratio, fuel types, and operating conditions affect the ash components and ash features (Vamvuka et al. 2009). Wang et al. 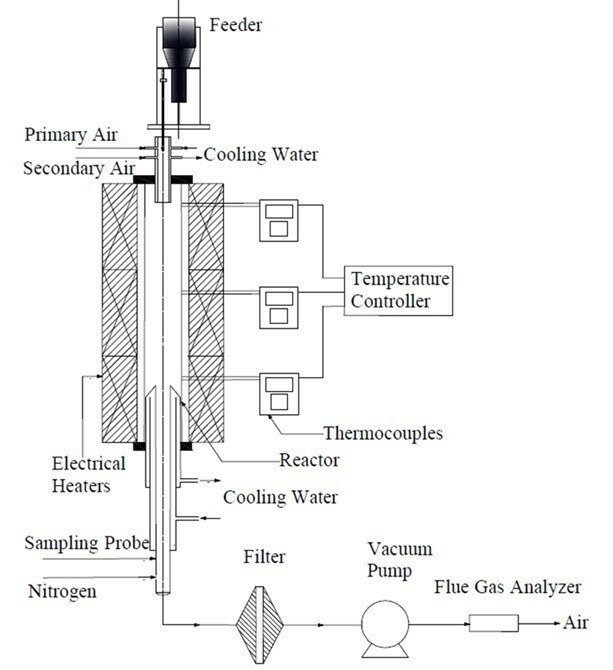 (2013) investigated the deposited behavior in a tube furnace and a Muffle furnace and discovered that the blending ratios of coal/straw caused different effects on the ash quantity. Shao et al. (2012) studied the co-combustion of lignite-peat blends in a bubbling fluidized bed combustor and found that the contents of the chlorine element, alkali/alkaline earth metals, SiO2, and Al2O3 of the feed played a key role in the ash deposition. The deposited Ca, Mg, Al, and Si elements were present mostly in the forms of calcium and magnesium sulfates, aluminates, and silicates that have relatively low melting points (Qiu et al. 2014). Liao et al. (2015) found that under high temperature combustion conditions, alkali metal-related compounds, which had low melting points and easily condensed on the flue surface as fly ash, caused fouling and high temperature corrosion. Vassilev et al. (2010) studied the mineral differences between biomass and coal, and found some possible reversible coupling reactions between the minerals from the coal and chloride in the biomass during the co-firing process. However, the amounts of K and Na released during co-combustion could be reduced by the effects of Fe, Ti, S, Si, and Al from the blended fuels (Li et al. 2014). There have been some studies focused on biomass alkalis or coal ash-related problems, which mainly investigated the biomass pyrolysis process (Keown et al. 2005), biomass combustion process (Liao et al. 2012), or coal combustion characteristics (Song et al. 2013; Wen et al. 2014, 2015, 2016). However, there has been no method accurate enough to evaluate the ash behavior during biomass co-firing until now, and the problem ofslagging remains far from being solved. Moreover, the effect of blendratios, combustion parameters,and biomass typesduring co-firing on theash deposition behavior is still unclear. The objective of this study was to investigate the effects of the blend ratio, temperature, and excess air coefficient on the fouling and slagging characteristics during co-combustion with cotton stalk. Then, the slagging characteristics of coal co-combusted with sawdust, rice husk, and cotton stalk at the same operating conditions were also studied. The chemical compositions, morphology, and mineral phase characteristics of the ashes were also analyzed using inductively coupled plasma (ICP), scanning electron microscopy energy dispersive spectrometry (SEM-EDS), and X-ray diffraction (XRD), respectively. Semi-quantitative calculations were performed using the software HighScore to investigate the primary cause for ash deposition. The ash deposition behavior and transformation of the chemical compositions of the ashes from co-fired coal and biomass were considered. One typical Chinese coal Huang Ling bituminous coal sample (HL coal) (Huangling Mining (Group) Co., Ltd., Yanan, China) and three typical biomass samples (cotton stalk, rice husk, and sawdust) were used in this study. The biomass samples were pulverized and sieved into particles with sizes less than 100 mm, and the particles size range for coal was less than 80 mm. Prior to the experiments, the samples were oven-dried for 3 h at 55 °C, and then the material was stored under dry conditions at room temperature. The analyses of the experimental materials were conducted with a CHNS/O elemental analyzer (Vario MICRO cube, Elementar, Langenselbold, Germany). Proximate analysis was performed following the procedures specified in GB/T 28731 (2012), the standard of the proximate analysis of solid biofuels. The lower heating value (LHV) was determined using an oxygen bomb calorimeter (Parr6300, Parr Instrument Company, Moline, USA). The ash composition of all of the fuels were determined using an X-ray fluorescence spectrometer (EAGLEIII, EDAX lnc., Mahwah, USA). The characterizations of the all of the fuels are listed in Table 1. Compared to the HL coal, the three kinds of biomass had high concentrations of chlorine and potassium in their ash, but lower sulfur contents. In addition, the sawdust had a much lower chlorine content compared to the cotton stalk and rice husk. With regards to the ash composition, the coal ash was rich in SiO2 and Al2O3 (78.55%), the sawdust ash was made mostly up of SiO2 and CaO (51.28%), the rice husk ash consisted mainly of SiO2 (90.57%), and the cotton stalk ash mainly contained SiO2, CaO, and K2O with some MgO and P2O5. To ensure complete burning and reduce the impact of the unburned carbon, the primary air and secondary air were heated to 200 °C before entering the furnace. For each experiment, the stable combustion lasted 1 h or more with a continuous-feeding system, and the on-line flue gas analyzer was used to monitor the contents of O2 and CO in the flue gas. Altogether, the ashes were generated from 1 single fuel and 7 blended fuels in the experiments. The reaction temperature was set at 1050 °C and 1300 °C with excess air coefficients of 1.2 and 1.4. The fuels were burned in simulated air atmosphere (20 vol.%O2/80 vol.%N2). The contents of the coal and biomass in the fuel blends and control conditions used in the experiments are shown in Table 2. After combustion, most fly ash particles were blown and condensed on the water-cooled sampling probe. The rest of the fly ash particles were blown into the glass fiber filter with pore size of 0.3 mm at the outlet of sampling probe. Both the ash particles were collected, blended well in the filter for further analysis. where RIRi is the ratio of the intensity of the strongest peak of the sample and corundum, Ii and Icol are the integrated intensities of the strongest peak of the sample and corundum, respectively, Wi is the relative content of the crystalline compounds (%), N is the number of phases in a system, ai is the mass fraction of the Si element in the molecular weight of each phase (%), and β is the content of Si in the slag and ash (%). 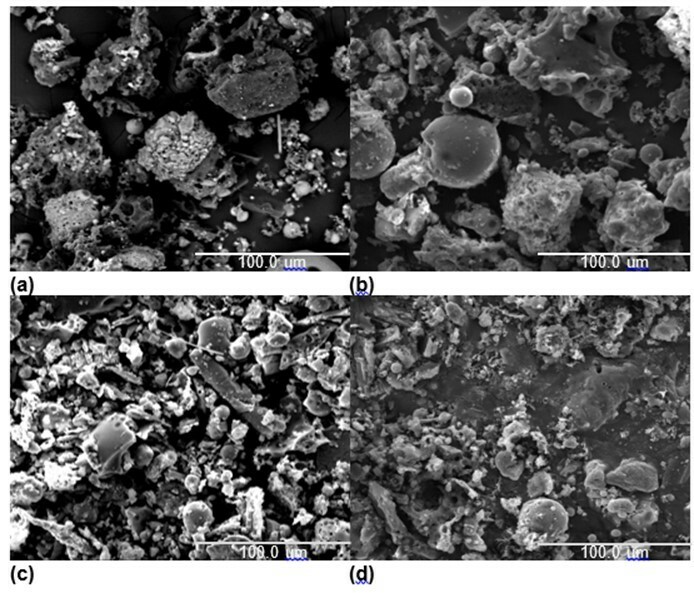 Figure 2 shows the SEM photomicrographs of the ash specimens from the co-firing of coal with cotton stalk ratios of 0%, 10%, 20%, and 30%. As for the coal ash from the DTF, shown in Fig. 2(a), the fine sticky particles acted like a glue to stimulate the sintering behavior of the ash. Additionally, spongy and irregular particles were also present. Comparing Fig. 2(b) to Fig. 2(a), it was seen that the co-firing of coal and biomass enhanced the sintering degree of the ash. Parts of the ash particles melted into large spherical particles, and other fine particles adhered to those particles. When the blending ratio rose to 20%, it was seen that severe agglomeration was caused because the ash was fully molten in the DTF, which was suggested by the spherical shape of the ash particles. When the ratio reached 30%, the combustion retention fused and condensed, and a compact nonporous globule was formed. The results indicated that the fusible composition in the ash increased, and the ash agglomeration tendency was promoted by the biomass being in excess of 20% cotton stalk. Therefore, it was reasonable to speculate that, when co-firing with HL coal, the blending ratios should be limited to 20% or less of cotton stalk. The results of the EDS analysis are shown in Table 3. When the ratio of blending increased from 0% to 30%, the concentrations of K, Ca, Na, Fe, and Cl clearly increased, and the concentrations of Si and Al decreased. This was in accordance with the large amount of alkali metals in the ash of the cotton stalk, and with the more severe agglomeration that was seen. And it was observed that the alkali metal enrichment of the slag caused the agglomeration to become more serious as the blending ratio increased. This was similar to the results of Müller et al. (2006). A difference from the coal combustion was noted that there was a clear iron content increase when biomass was co-combusted with coal. According to the increasing chlorine contents, It was speculated that some of chlorides in fly ashes might deposit on the cold surface of the probe as used in this study, thereby causing high temperature corrosion in the combustor (Hansen et al. 1999, Li et al. 2014, Shao et al. 2012). Thus, the iron on the sampling probe was transformed into Fe2O3 and collected into ash samples, which led to the significant Fe contents increasing in EDS results. According to the results of the XRD analysis, shown in Fig. 3 and Table 4, KAlSi2O6 (6.78% to 7.2%) and CaAl2Si2O8 (20.37% to 28.43%) were detected in the blending slag with a ratio of 10%. When the blending ratio was increased from 10% to 30%, the content of detected KAlSi2O6 and CaAl2Si2O8 both increased. It was also observed that when the cotton stalk content was higher than 30%, some KCl was detected. Wei et al. (2005) found that chlorine could increase the volatility ofthe alkali metal elements. Yang et al. (2014) showed that the content of the alkali vapor was mainly affected by the chlorine content rather than by the alkali metal itself. Another study dealt with the release and transformation of alkali metal species co-combustion of coal and S-rich wheat straw. It was found that the releasing processes of Cl and alkali metals were consistent at high temperatures, and it was apparent that there were chlorides formed with the emission of alkali metals (Li et al. 2014). Therefore, with the high content of K in the mixed fuel, some KCl was produced in the early combustion stage. Nevertheless, due to the short residence time, the KCl did not react with the Si and Al completely but was vaporized and condensed onto the ash particles. The melting point of KCl (776 °C) is much lower than that of KAlSi2O6, and so, KCl reacted easily with SiO2 to form a low melting point compound, which lowered the melting point of the slag residual. Thus, in the burning process, the higher blending ratios caused the release of KCl that attached to the surface of the ash particles, which led to serious agglomeration. Hence, as the blending ratio increased, the content of alkalis in the biomass increased, the content of formed KAlSi2O6 increased, the melting point of the ashes was lowered, and ultimately, more serious agglomeration occurred. 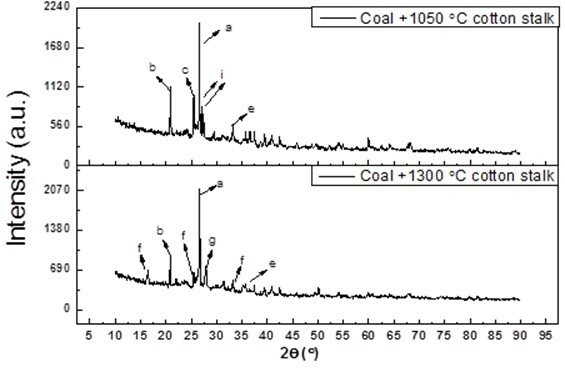 Figure 4 shows the microstructure of the ash and slag for coal that was co-combusted with 20% cotton stalk at 1050 °C and 1300 °C. As shown in Fig. 4, when the combustion temperature was 1050 °C, there were many small particles present, and most of the ash particles were loose, spongy, and irregular. No obvious sintering was found. When the temperature increased from 1050 °C to 1300 °C, the spherical shape of the ash particles suggested that the ash was fully molten. It was seen that an increased co-combustion temperature enhanced the sintering degree of the ash. This reaction was used to predict that potassium feldspar transforms into leucite at the noted temperature of 1220 °C. When the temperature increased from 1050 °C to 1300 °C, this transformation occurred. In addition, at the higher temperature, more fusible components were generated, which caused more agglomeration. There were not many differences in the surface morphology and microstructure of the co-fired slag when the excess air coefficient increased from 1.2 to 1.4, and so, the SEM image was not displayed in this paper. Table 5 shows the elemental composition of the slag when co-combusted with different excess air coefficients. The results showed that the content of S increased with a higher excess air coefficient. This was possibly because more S was fixed in the reaction when it reacted with the alkali and alkaline metals. However, the sulfur-fixed reaction did not change the melting characteristics of the ash and slag, and there were no noticeable changes to their physical appearance. In Fig. 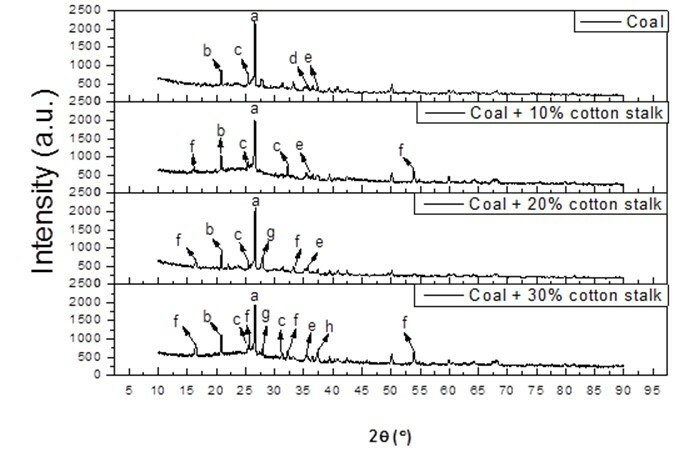 6, when the excess air coefficient increased to 1.4, the diffraction peak of K2SO4 in the XRD spectrum of the slag did not appear, and the CaAl2Si2O8 transformed into CaSO4, which was the main existing form of Ca. The reason for that may have been that K2SO4 was not stable at high temperatures, and it broke down to release SO2 (Johansen et al. 2011). When the excess air coefficient was increased, an excess of O2 could promote the sulfation reaction, especially during the step for the formation of SO3 (Theis et al. 2006). Thus, S may be captured by Ca compounds, the formation of stable sulfates CaSO4 is the dominant reaction path (Aho and Ferrer 2005; Li and Fang 2015; Mueller et al. 2006; Xiao et al. 2017). At the high temperature condition, the oxidation environment and the presence of Fe, Si, and Al remarkably promoted the sulfur fixation reaction of Ca. The CaSO4 was considered to bond effectively between the particles, thus increasing the slagging tendency. Thus, the higher excess air coefficient accelerated the sulfur reaction, but did not relieve the heavy sintering. 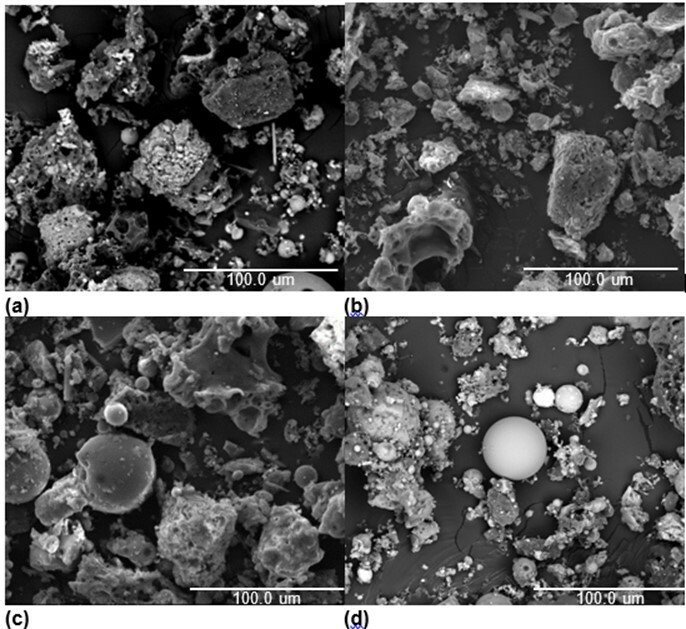 Figure 7 shows the SEM photographs of the microstructures of the four ash samples. For pure coal, the photographs showed some small particles on the surface, and no serious melting and agglomeration. However, combustion of the fuels with biomass added in (biomass/coal = 20 wt.%) enhanced the sintering degree of the ash. It is worth noting that the slag deposited from coal combusted with 20% cotton stalk had a compact morphology with larger blocks and less debris, and the surface of the blocks was smooth and dense. It was speculated that there were some compounds with low melting points generated in this ash sample. The phenomenon indicated that low melting point compounds played an important role in the slagging and fouling process. However, there was a big difference between the ash samples co-fired of coal/rice husk blends and coal/cotton stalk blends. Its particles were smaller, broken, and formed a loose structure. The morphology of the slag from coal co-fired with sawdust had more agglomeration than that of the slag from coal co-fired with rice husk and less than that of the slag from coal co-fired with cotton stalk. Table 6 shows the EDS results of different ash samples. The Al, Si, Ca, and Fe were the main inorganic elements, and there were limited amounts of Na, Mg, K, Cl, and S. The samples of adhered fouling from the coal combustion and coal co-combusted with 20% rice husk both had very high amounts of Si, but there was more Na, Mg, and K in the coal co-fired with rice husk. The slag of the co-combusted cotton stalk had the highest contents of K, Fe, Cl, and S, and the lowest contents of Si and Al. Mi et al. (2004) found that the biomass had a higher alkaline oxide content with higher ion potential energy than the coal, and the polymer compounds were damaged during the melting of the ash. Hence, the addition of biomass decreased the melting point of the ash. Therefore, the severe agglomeration caused by the cotton stalk addition might have been due to the higher content of alkali metal elements, especially K. Meanwhile in the coal ash and coal-rice husk ash, the content of silicon was 53%, and the alkali metals content was lower. This was in accordance with the SEM photographs in Figs. 2(a) and 2(c). The element contents of the co-combusted sawdust were between the element contents found for cotton stalk and rice husk, except for the contents of Na and Ca, which were the highest, and the S content, which was the lowest. The XRD results of the ash particles are shown in Fig. 8 and Table 7. The major crystalline compound present in the slag during coal combustion was SiO2. However, after introducing the cotton stalk, there was not only SiO2 observed in the deposits, but also, CaAl2Si2O8 and KAlSi2O6. The content of KAlSi2O6 was much higher, and the content of SiO2 was lower than in the other co-combusted ashes. 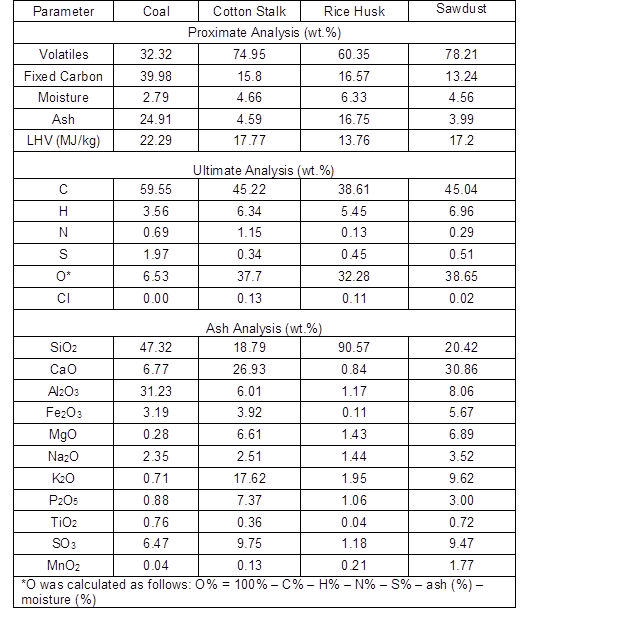 This was in accordance with the lower Si content and higher K content of the coal-cotton stalk ash in Table 6. Wei et al. (2002)showed that KAlSi2O6 (leucite) has a low melting point (about 1100 °C), and it easily melts with SiO2 to form glassy, sticky, and fusible compounds, which noticeably enhances the cohesiveness between the ash particles. Additionally, Fe2O3 was detected in the coal-cotton stalk ash. Russell et al. (2002) reported that Fe2O3 very effectively fluxes with aluminosilicates, which lowers the melting point and viscosity of the ash. Thus, the presence of Fe2O3 promoted the ash deposition behavior. The major compounds in the ash of coal co-combusted with sawdust were KAlSi2O6 and CaAl2Si2O8. Because the CaAl2Si2O8 (anorthite) has the highest melting point and a favorable thermal stability in feldspar minerals, it did not help to generate fusible compounds. The major compounds present in the ash formed by coal co-combusted with rice husk were SiO2 and CaAl2Si2O8. And the main mineral in coal ash are quartz (SiO2), anhydrite (CaSO4), and CaO. All of these compounds had higher melting points, and there were no fusible compounds detected, such as KAlSi2O6. By comparison, the CaSO4 and CaO have relatively higher viscosity than CaAl2Si2O8, and they play a role of glue to stimulate the agglomeration behavior of the ash (Luan et al. 2014). Therefore the agglomeration of ash from coal and rice husk blend fuel (shown in Figure 7 (c)) is less than that from pure coal. According to the above analysis, when coal was co-fired with cotton stalk, the content of KAlSi2O6 increased, which implied that the ash deposition tendency was considerably promoted by the biomass, which had a higher content of potassium. Therefore, it was reasonable to presume that, from the degree of agglomeration, when co-firing with biomass, the K content in the blending fuel should be limited. Co-firing coal and biomass is an effective technology for reducing the net emission of CO2. The properties of co-fired coal and biomass vary widely, causing complexity in the ash deposition behavior. The results of this study showed how different blending ratios, combustion temperatures, excess air coefficients, and different biomass types affected the slagging characteristics and composition of the ash. The content of the alkali metal K in the biomass was found to be one of the critical factors in determining the characteristics of the blended fuel ashes. 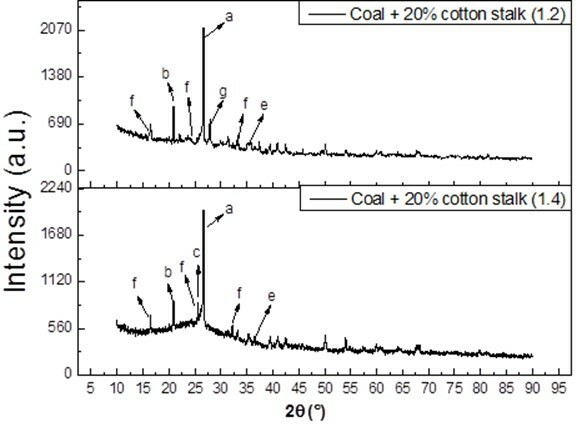 When co-firing coal with different proportions of cotton stalk, the degree of deposited ash increased with the increasing cotton stalk ratio in the fuel blends. To avoid ash deposition problems, the content of cotton stalk in the fuel blends should be limited to 20%. The sintering characteristics of ash were related to the chemical compositions. When the combustion temperature was low, the K was mainly found in KAlSi3O8 in the ashes. Then, the KAlSi3O8 was converted to KAlSi2O6 after the temperature increased to above 1220 °C. This increased the adhesion of the slag particles and decreased the melting point. Hence, when co-firing with 20% cotton stalk, to prevent ash-related problems, the combustion temperature should be no higher than 1220 °C. When the excess air coefficient was increased at the high temperature, S preferred to react with Ca and created CaSO4, rather than fixing the K element into K2SO4. This reaction only changed the ash composition, and had no effects on the melting characteristics. After comparing the characteristics of the ash from co-firing with cotton stalk, rice husk, and sawdust, the most severe agglomeration was seen in the ashes from co-firing with cotton stalk, and no obvious sintering was found in the ash from the coal co-fired with rice husk. Co-firing with sawdust caused a middle degree of agglomeration in the ash. The authors wish to express great appreciation for the financial support from the National Natural Science Foundation of China (51476067 and 51376067), the National Basic Research Program of China (2013CB228102), the Special Fund for Agro-scientific Research in the Public Interest (201303095), and the Fundamental Research Funds for the Central Universities, HUST (CX15-019). This study also benefited from the assistance of the experimental studies support from the Analytical and Testing Center at Huangzhong University of Science and Technology. GB/T 28731 (2012). “Proximate analysis of solid biofuels,”Standardization Administration of China, Beijing, China. Hansen, L. A., Frandsen, F. J., Dam-Johansen, K., Sorensen, H. S. and Skrifvars, B. J.(1999). “Characterization of ashes and deposits from high-temperature coal-straw co-firing.” Energy & Fuels, 13(4), 803-816. DOI: 10.1021/ef980203x. Li, F., and Fang, Y. (2015). “Modification of ash fusion behavior of lignite by the addition of different biomasses,” Energy & Fuels 29(5), 2979-2986. DOI: 10.1021/acs.energyfuels.5b00054. Mi, T., Chen, H., Wu, Z., Liu, D., Zhang, S., Wu, C., and Chang, J. (2004). “Chemistry characteristic study on biomass ash,” Acta Energiae Solaris Sinica 25(2), 236-241. Nystrom, R., Lindgren, R., Avagyan, R., Westerholm, R., Lundstedt, S., and Boman, C. (2017). “Influence of wood species and burning conditions on particle emission characteristics in a residential wood stove,” Energy & Fuels 31(5), 5514-5524. DOI: 10.1021/acs.energyfuels.6b02751. Theis, M., Skrifvars, B.-J., Zevenhoven, M., Hupa, M. and Tran, H.(2006). “Fouling tendency of ash resulting from burning mixtures of biofuels. Part 2: Deposit chemistry,” Fuel, 85(14-15), 1992-2001. DOI: 10.1016/j.fuel.2006.03.015. Wen, C., Gao, X. P. and Xu, M. H. (2016). “A CCSEM study on the transformation of included and excluded minerals during coal devolatilization and char combustion,” Fuel, 172, 96-104. DOI: 10.1016/j.fuel.2016.01.005. Wen, C., Xu, M. H., Zhou, K., Yu, D. X., Zhan, Z. H., and Mo, X. (2015). “The melting potential of various ash components generated from coal combustion: Indicated by the circularity of individual particles using CCSEM technology,” Fuel Processing Technology 133, 128-136. DOI: 10.1016/j.fuproc.2015.01.012. Wen, C., Yu, D., Wang, J., Wu, J., Yao, H., and Xu, M.(2014). “Effect of the devolatilization process on PM10 Formation during oxy-fuel combustion of a typical bituminous coal,” Energy & Fuels 28(9), 5682-5689. DOI: 10.1021/ef501264v. Wen, C., Xu, M., Yu, D., Sheng, C., Wu, H., Zhang, P. a., Qiao, Y. and Yao, H. (2013). “PM10 formation during the combustion of N2-char and CO2-char of Chinese coals.” Proceedings of the Combustion Institute 34(2), 2383-2392. DOI: 10.1016/j.proci.2012.07.080. Xiao, H., Li, F., Liu, Q., Ji, S., Fan, H., Xu, M., Guo, Q., Ma, M., and Ma, X. (2017). “Modification of ash fusion behavior of coal with high ash fusion temperature by red mud addition,” Fuel 192, 121-127. DOI: 10.1016/j.fuel.2016.12.012. Article submitted: February 16, 2017; Peer review completed: June 10, 2017; Revised version received: July 11, 2017; Accepted; July 12, 2017; Published: July 17, 2017.